I can remember my mother telling me that in order to fall in love, you must put your energy towards the heart and the stomach. 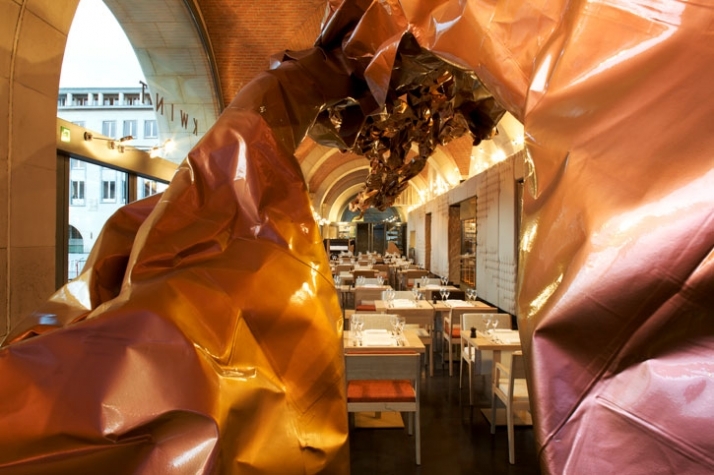 Studio Arne Quinze (SAQ) out of Brussels, Belgium clearly understands the recipe for love. 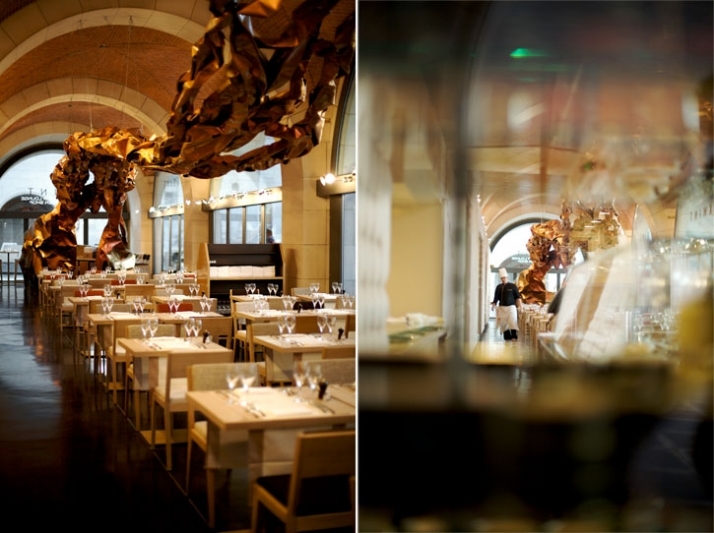 Located in the heart of the city, at the Mont des Arts, lies a small yet big idea restaurant, KWINT. 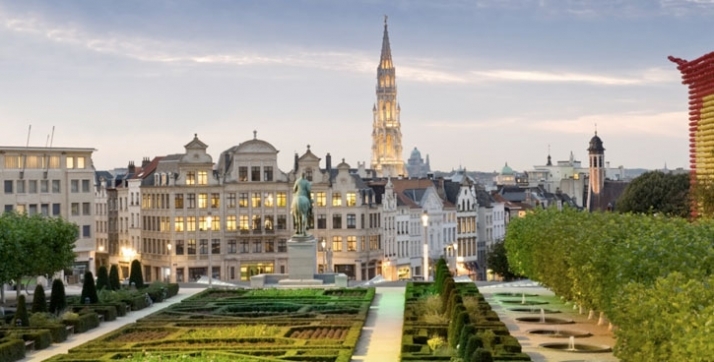 It sits within the recently renovated Congress Palace that was inaugurated during the Brussels World’s Fair in 1958. 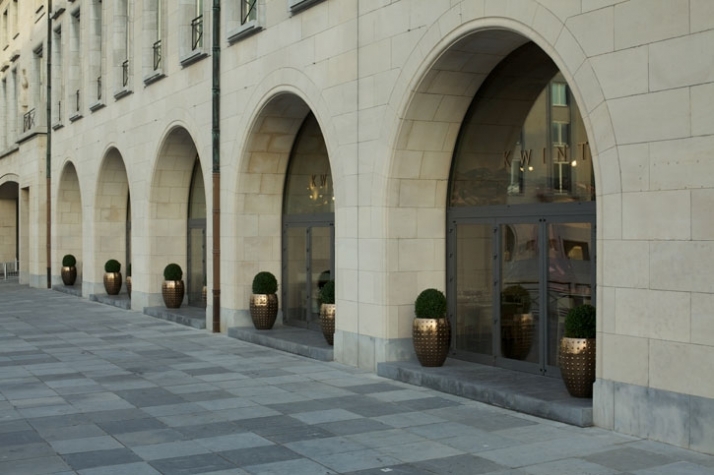 Considerably outdated and under utilized, the space went through an intense renovation process and was renamed SQUARE-Brussels Meeting Centre. With an upgrade to accommodate the latest activities, conferences and experience to locals and visitors, SQUARE embraces the latest by Studio Arne Quinze’s, the KWINT Public Restaurant. 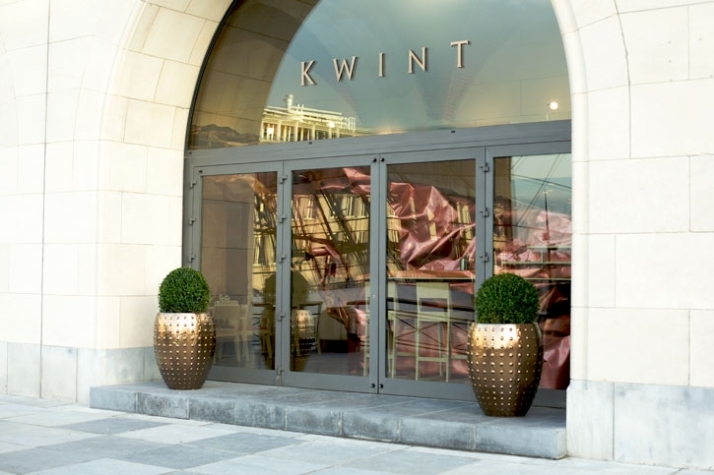 KWINT refers to the five arched windows in the newly opened restaurant. 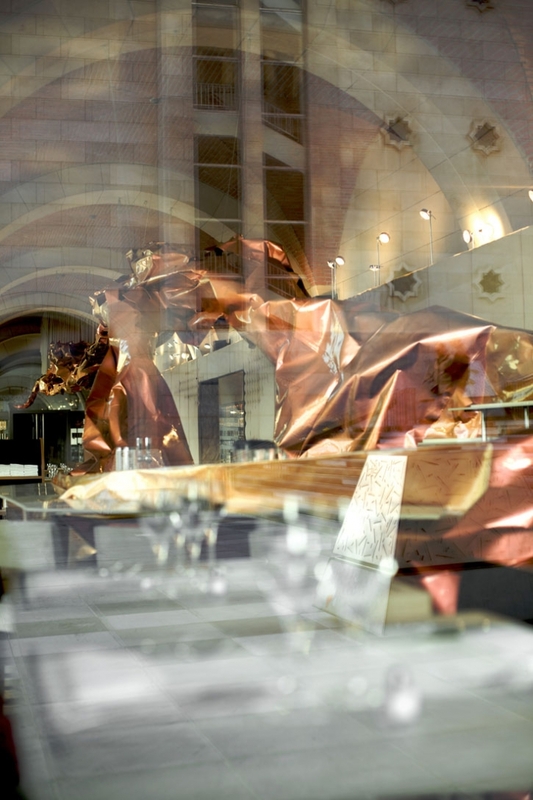 The restaurant is enclosed by custom sized glass designed to fit delicately within the heavy existing architecture, creating a strong connection between history and modernization. This transitional solution allows natural light to enter the space and provides breathtaking views of the city. The interior unfolds a 30m-long sculpture that uses reflection and inflection to unfold mood and experience. 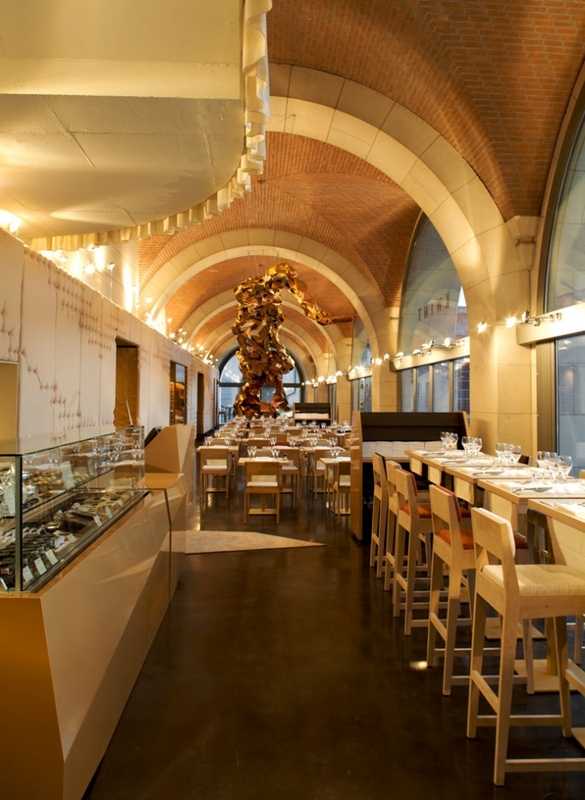 A warm and neutral color palette harmonizes with the natural stone of the historic building and sets the dining experience. 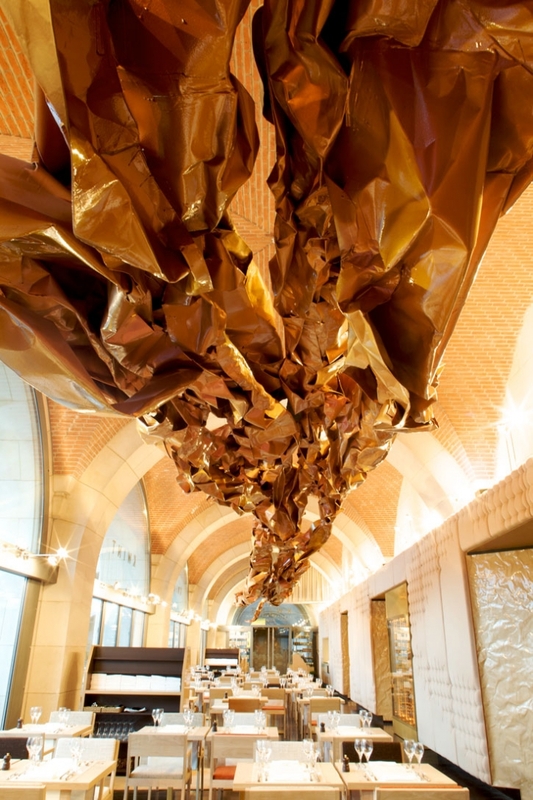 The dimensionality of the sculpture emphasizes the horizontality of the space while light reflects off the sculpture and grazes the walls to divide the space and create an intimate, magical experience that is light and refreshing. A long tufted wall adds a new texture, warmth and a fresh visual cue to the vertical divider. The tufted gestures add elegance yet a playful sequence as they are never finished throughout. This interplay of texture creates a harmony within the space as the textures become the movement and focus rather than the color palette. Even the furniture is created skillfully to be an asset to the design concept. KWINT shows yet another masterpiece of a beautiful interior space with a stroke of genius. Studio Arne Quinze (SAQ) continues to delight us with forward-thinking design, hyper-sculptures and a balance of order and chaos. I always seem to envision the SAQ as a team of street performers and classical musicians playing the same tune to their own style. Thanks for another great design recipe. What a way to begin the 2010! 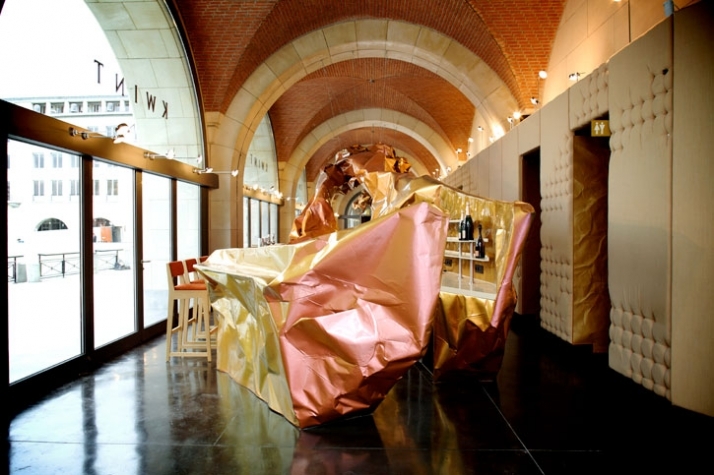 Studio Arne Quinze loves Yatzer and we love them back.